Earlier this week, I went went my parents and a few family friends to see the Stratford Festival's production of Peter Pan. It was great fun, well staged, beautifully costumed and acted, with Tom McCamus as an elegant Captain James Hook, who must be one of the most entertaining stage villians to play. It was nice to be there with my parents. I have strong memories of going to see pantomimes as a family when I was young, and I'm sure that it was one of the things that influenced my love of the arts and performance. We are all getting a lot greyer, but it was good to still sit and laugh and enjoy the spectacle of Peter Pan as a family. 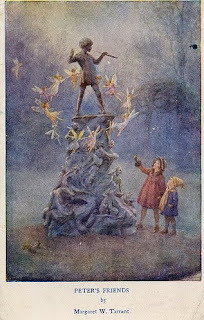 I like the mythology of Peter Pan, and I do believe that J.M Barrie captured some of the otherness of the fairy realm quite well. There is magic and wonder and adventure, but always that hint of sadness, death and loneliness. In the program notes for the Stratford production, Bob Hetherington writes, "Peter Pan is arguably the last man-created myth of near-universal appeal, in the sense that subsequent fantasy narratives have tended to be regarded as pastiches of general to which Barrie's belong unambiguously." In a sense, Barrie's word is a pastiche, a blending together of fairy lore, Rackham-esque buccaneers and classical mythology. But it does have a remarkable wholeness that does, as Hetherington argues, move it beyond a pasting together of motifs towards its status of modern myth. As a storyteller, I loved the framing of the Stratford production around the on-stage presence of J.M Barrie as narrator. And I had nearly forgotten as an adult that it was storytelling that enticed Peter to the Darling household, and that it was Wendy's professed talents as a storyteller that ultimately took her to Neverland. All in all, a great production, for all those who believe in fairies, or those who never really wanted to grow up. Hey Dale! This is John David Hickey from Montreal. We've met a couple of times at various fests across Canada.